This sixth installment of the Anna Hibiscus series finds Anna leaving the big white house in the city where she lives with her extended family to experience life in Grandfather’s rural village. As with the other stories, the country is not identified. Possibly it is Nigeria, where Atinuke grew up. This vagueness is somewhat problematic. Africa is a huge continent; implying that all African village life is like Grandfather’s village is something of an oversimplification. On the other hand, not identifying the country avoids geopolitical issues that are well beyond the scope of an early chapter book. In the city Anna lives a protected and somewhat privileged life. In the village she learns the practical reasons for doing things the “bush” way—despite her aunties’ implication that “bush” is bad. The mixed-race girl also experiences prejudice because she is an “oyinbo,” a “light-skinned foreigner,” and realizes that she can both teach the children in the village and also learn from them. 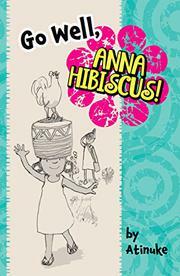 Filtered through Anna’s open-hearted innocence these lessons do not feel preachy. It seems perfectly natural that Anna’s spelling words are “equality,” “opportunity,” “cooperation,” and “friendship.” Tobia’s grayscale illustrations parallel the story, with Anna and her winsome smile always at center stage.